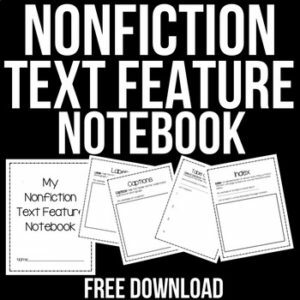 This is a great way to teach and reinforce nonfiction text features/information text features in your classroom! Students will be actively engaged in your lessons and will take pride in their notebooks. Students will create a scrapbook/interactive notebook by looking for text feature examples or creating their own. This notebook includes 15 amazing pages (one for each text feature)! Please leave feedback for your FREEBIE. THANKS! Please check out some of my other products! ← Save Those Sports Photos!